C7 Modular Combo Bounce house made by Ninja Jump. The Ninja Jump Modular Combo C7 is a high quality inflatable that your kids will love. 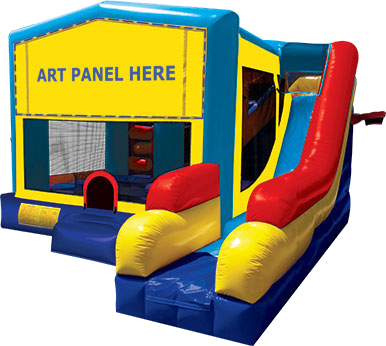 It has plenty of room to bounce, horizontal and vertical pop ups, climber,slide and 2 basket ball hoops. One on the inside and the other on the outside. Add your favorite banner to the front to match the theme of your party. We have many to choose from. See the banner section of our website. 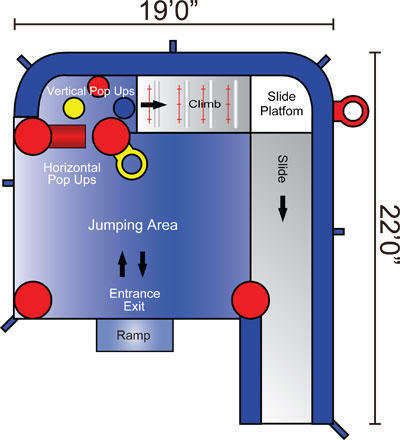 LARGE BOUNCE AREA , OBSTACLES, SLIDE, BASKETBALL HOOP. PICK THE THEME THAT YOU WANT! MANY TO CHOOSE FROM!